My parents are both very active in the St Vincent DePaul Society in Colorado. Their dedication to helping people has been inspiring. Last summer I gave them about a dozen quilts to pass along to people in need. Two of my favorite recipients have been a young girl and a woman with MS. The quilt with stripes now belongs to the young girl. I loved making this quilt because I used close to a 100 different dot fabrics. It is colorful and fun. 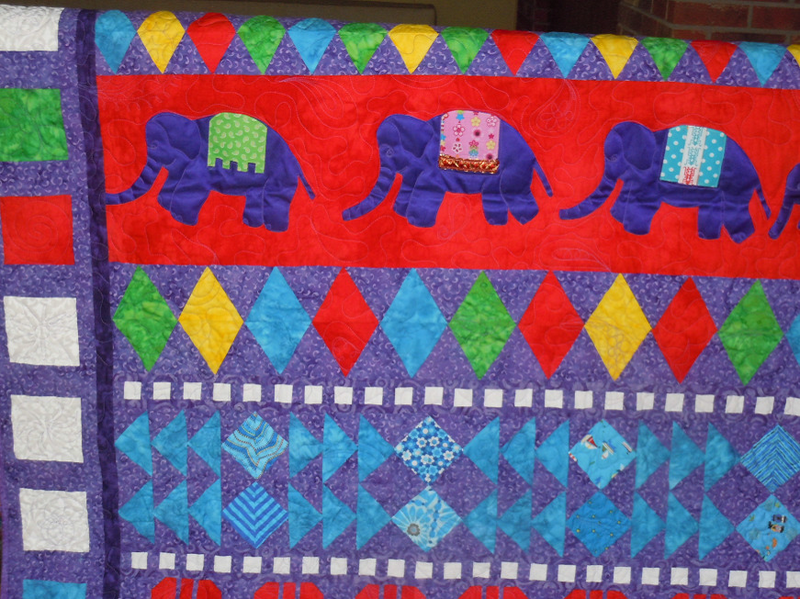 The quilt with the purple elephants now belongs to the woman with MS. This quilt was really fun to make because of the story behind it. The inspiration for it came from some saris that my friend’s mother brought here from India. She wore the saris for years and wanted to know if I could repurpose them into a quilt. Well the weaves/fabric of the saris were so beautiful I couldn’t bring myself to cut into them. Instead I tried to copy the pattern of the weave from one of them and turn it into a quilt. I added in the elephants because it seemed like it needed something fun in it. Last weekend, my Mom, my daughter and I worked on another quilt for our local St Vincent DePaul Society. I made this quilt from some leftover parts I had in my studio. 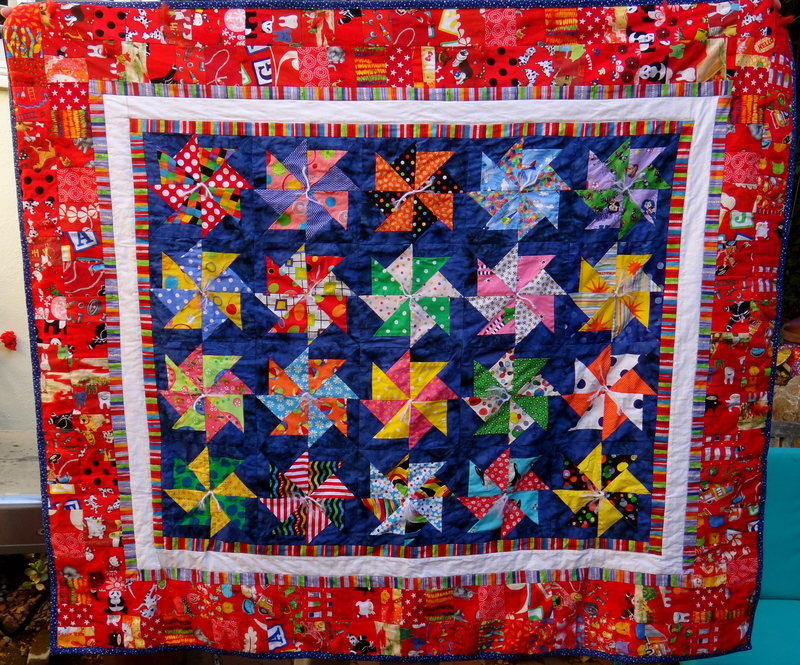 The pinwheels are from a quilt I made for my Aunt and the red border came from leftover strata pieces. We decided to “tie” the quilt and had a lot of fun doing that. We learned it is much easier to get the needle thru the areas that did not have seams…seems obvious, but I wanted the ties to be in the center of the pinwheels 🙂 Talk about the need for strong thumbs and fingers!! Here is our finished project – it is officially waiting for a home now! All of your quilts are fun and colorful. You are truly a creative person! It must feel wonderful to make quilts for charity. These are great quilts. So colourful and happy. What wonderful gifts!